VenueVision, which provides high-impact, real-time digital media solutions to automotive dealerships, has just launched autoTEXT – a centralized texting solution that lets staff seamlessly connect with their customers, regardless of their Dealer Management System (DMS). This enables dealers to improve communication and service department productivity through more efficient and faster messaging. Increasingly, customers don’t want phone calls. They want texts. According to J.D. Power’s Customer Service Index, 27% of customers with mass market brand vehicles, 42% of premium brand customers and 41% of younger customers want to communicate by text. With autoTEXT, dealers don’t have to rely solely on staff mobile phones and costly cellular plans to communicate with customers. With autoTEXT, everyone has access to a centralized desktop system that sends and receives texts. Dealers can set a single number – or different numbers for each department – to manage texts from one place. Customers can text to request appointments or ask questions. Dealership staff can send service status updates, get repair authorizations, notify on service completions with payment options and more. Not only does the system streamline communication, it eliminates the cost of individual mobile phones and wireless plans. Texting doesn’t just make communication better – it builds retention. In the J.D. Power study, only half of the customers contacted by phone said they would return. For those who received texts, that rate jumped to two-thirds. Texts take a lot less time than repeated calls, phone conversations and voice mails. And it doesn’t just benefit service departments. 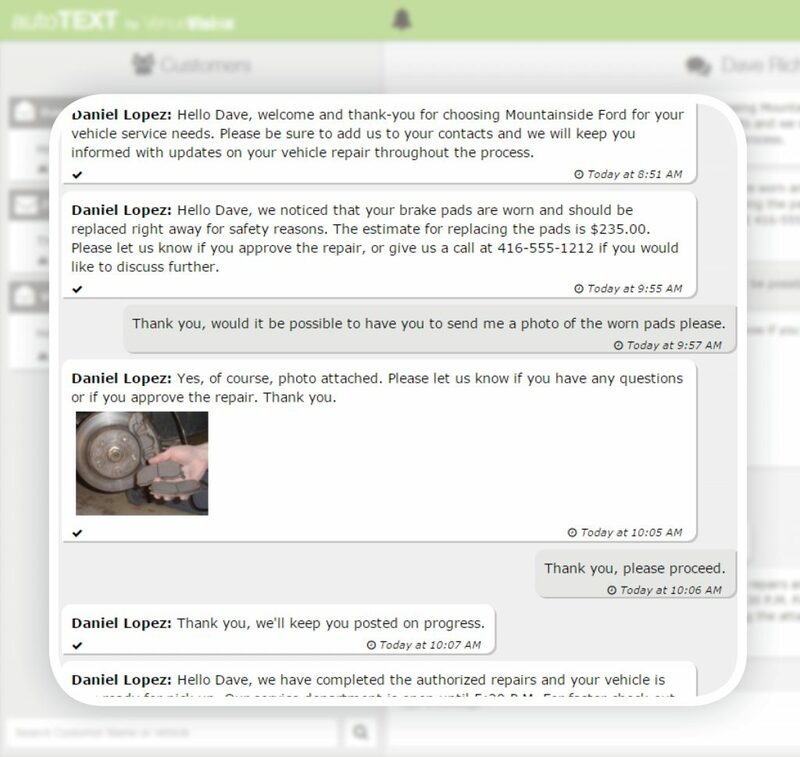 Parts departments can use autoTEXT to notify on special order parts arrivals, and sales departments can create and confirm sales appointments or test drives, follow up with customer and answer questions. autoTEXT packages start at $139/month per store, and are available to dealerships in Canada and the United States. Packages for unlimited users, unlimited data and optional payment capabilities through Mobile Cashier are also available. To start a trial or sign up for the starter package, visit http://www3.venuevision.com/automotive-solutions/autoTEXT. Dealers can try the 7-day trial by enrolling online and be up and running by the next business day.